This church, San Pedro Apóstol, in the small town of Andahuaylillas, outside of Cuzco, was built for Jesuits evangelizing the region. With parts dating to the early 17th century, the church is notable today for its painted interior. 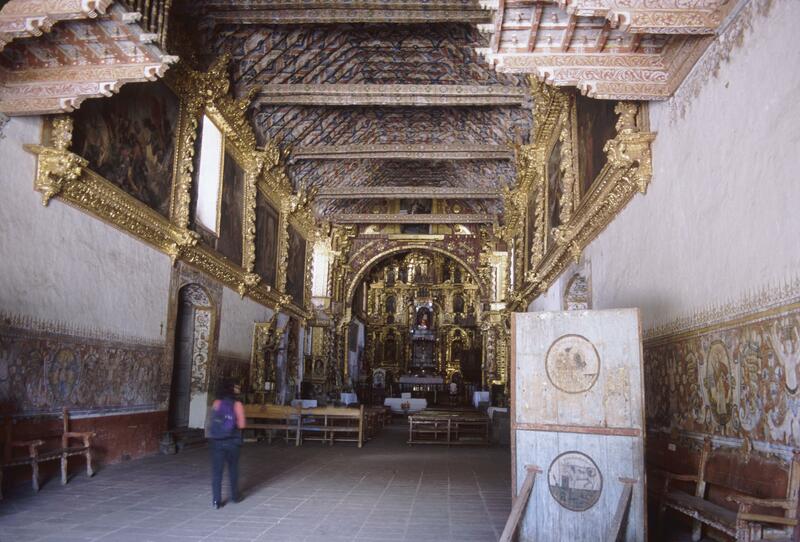 The framed paintings along the upper part of the nave depicting the life of Christ, and the ornately gilded retable (retablo) were later additions to the church interior, probably made in the late 17th or early 18th century. In the lower frieze, roundels of female martyrs (Saint Barbara, Saint Lucy) holding their distinctive palm fronds (symbols of martyrdom) are separated by ornamental female figures, whose torsos end in floral motifs. The Jesuits of Andahuaylillas undoubtedly planned the program of murals painted on these church walls in the 17th century. They would have drawn inspiration and ideas from European prints and book illustrations. Indigenous painters may have carried out the paintings, like the work of building itself, although the murals are unsigned. While other orders were at the forefront of evangelization in New Spain, in Peru and Brazil, the Jesuits played a key role. The church is a conventional single nave structure, built in an earthquake prone region. Thus, the roof is a lightweight latticework of wood. Its original interior paintings, inexpensive and rapidly executed, were painted directly on the plaster walls. Andahuaylillas lies in the rich Vilcanota river valley, about 40 km (25 miles) from Cuzco. It is primarily an agricultural area today as it was in the 17th century, when this church was built. 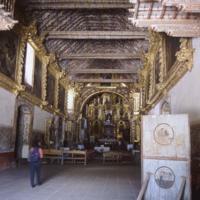 While Andahuaylillas is a provincial town, it was closely tied to other urban centers in the colonial period. The highland road that passed through it was well trod by the mule trains that traveled towards Puno and on to supply the miners of Potosí. Thus travelers as well as local residents might have worshipped in this church. Through the paintings in their church, Jesuits in Perú attempted to create a visual record of the saints and martyrs of Christian history. In this they followed the lead of other evangelizing orders in New Spain, who had likewise commissioned vivid murals celebrating Church history to cloak church interiors. By introducing a new visual culture and center of worship in Andahuaylillas, a place where Inka traditions had been strong, the Jesuits sought to call the Andean inhabitants towards belief in the world so vividly represented inside San Pedro Apóstol.